Sixteenth-century French literature, visual culture, emblematics, architectural history, spatial theory, domesticity, French cinema. Patricia A. Morton is Associate Professor of architectural history in the Art History Department. She has received grants and fellowships from the Getty Research Institute, the Fulbright Program, the University of California Humanities Research Institute, and the National Endowment for the Arts, among other institutions. Her book on the 1931 Colonial Exposition in Paris, Hybrid Modernities, was published in 2000 by MIT Press and in Japan by Brücke in 2002. Her current research focuses on postmodern architecture and popular culture, exemplified in the built work and writing of Charles W. Moore. She has published widely on architectural history and issues of race, gender and identity in modern and contemporary architecture. She is Editor of the Journal of the Society of Architectural Historians and an advisory board member of the European Architectural Historians Network journal, Architectural Histories. Assistant professor, School of Architecture and Urbanism, University of Brasilia. Graduate program assistant director for Architectural History, Theory, and Criticism. Architectural historian, architect, and historic preservationist. Theory and criticism of classical architecture and its influence on 19th- and early 20th-century modernity. Digital documentation and analysis of historic sites and buildings. Artificial intelligence (AI) has a wide variety of applications. This project will apply AI methods to discourses on historic architecture, a mode of communication inside architectural history that ties together textual descriptions, representations, and structured, logical understanding of the objects under study (buildings). The aim of this project is to develop an ontology, a knowledge representation for architectural history that will make possible applying methods from AI to historic descriptions of architecture. In the long run, this project will provide the means to analyze, interrelate, and even interconvert verbal and visual descriptions and information sources, providing an orderly way to manage and process collections of information, and thus facilitate historical research. I am a professor of modern architectural history and chair of the art history department. My research interests include monastic architecture and war museums, particularly those dedicated to WWII. I am currently First Vice President of the Society of Architectural Historians. Art history survey courses covering Prehistory to the 18th century. Women in architecture during the Fascist era. 1950s and 1960s Italian architecture and design. In addition to academic research, Ashley Gardini teach both art history and architectural history at community colleges in the San Francisco Bay Area. In 1957, Clinton Hartley Grattan, one of Australia’s most important foreign observers, wrote of the shadow of the “urban” in legends of the Australian “bush”.1 He argued that the early frontiers of Australian settlement were frontiers of men with private capital, or entrepreneurs, and those frontiers thus carried more elements of the urban than is commonly realised. Such early colonial enterprises around Australia’s south and southeastern coasts, and across the Tasman included sealing, whaling, milling and pastoralism, as well as missionary, trading and finance ventures. In advance of official settlements in the late-eighteenth and early-nineteenth centuries, entrepreneurs mapped coastlines, pioneered trade routes and colonised lands. Backed by private capital they established colonial infrastructural architecture effecting urban expansion in the Australian colonies, New Zealand and beyond. Yet this architecture is rarely a subject of architectural histories. Sarah is Postdoctoral Researcher in the Humanities at the Society of Architectural Historians. This is a newly created position supported by the Andrew W. Mellon Foundation. Sarah is charged with collecting data to help SAH and the Mellon Foundation understand the current status of architectural history in higher education in the United States, part of a 21-month study of the state of the field of architectural history. As a scholar and educator, Sarah has focused on the connections between architecture and modernity since the industrial and scientific revolutions of the late-18th century. Her next project will study Sigfried Giedion’s appropriation of Einstein’s theory of relativity for Space, Time, and Architecture. She is also a digital humanist; her latest project is Contingent Talk, a limited-run podcast series about precarious academic labor that she produced for the College Art Association’s CAA Conversations initiative. Two of Sarah’s other digital humanities projects can also be viewed online right now. One is The Vanishing Porch in Perspective, a #MeToo/#TimesUp-inspired website she developed as a companion for an academic article she wrote about the Farnsworth House. The other is Afterimages, an online exhibition about the intersection of democratic free expression and historic preservation in Chile that Sarah developed in collaboration with Dr. Catherine Burdick. Humanities Commons administrators highlighted The Vanishing Porch in Perspective and Afterimages during their session at CAA’s 2018 annual conference (see slides 28 & 29 here for more details). 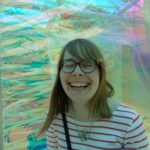 You can also listen to Sarah talk about her project site design in this Platypus blog post: HC User Spotlight: Sarah M. Dreller. Sarah is a member of the Women Also Know History network. Here is her individual scholar page. Sarah was a part-time professor and mentor from 1996 until 2017. She also had an award-wining predoctoral career was a historic preservation project manager. She is a qualified Architectural Historian under the United States Secretary of the Interior’s Professional Qualification Standards 36 CFR Appendix A to Part 61(c). Read more about Sarah in this July 2017 interview by Design Feast. Sarah is a runner and enjoys following tennis and Formula 1. She also loves anything having to do with space—especially sci-fi films of all kinds–and is determined to attend NASA Space Camp one day.